Mapmakers must hate Greece: the country contains approximately 6,000 islands, but only 227 are inhabited. Cruising the isles brings visitors the richness in almost as many ways as there are Grecian dots on the map, including safe turquoise water, sandy beaches, adventure, mystery, romance, and the echoes of mythological Gods. Surprisingly, the trip can be easy on the budget, depending on the cruise company and length of itinerary. All the major cruise lines offer itineraries, but differ in their amenities and island-hopping style. Some move in rapid succession; others spend overnights in idyllic ports. Make sure the line you choose stops long enough at the destinations you want to see. (I picked Celestyal, the economical Greek line that docks overnight in both Mykonos and Santorini. 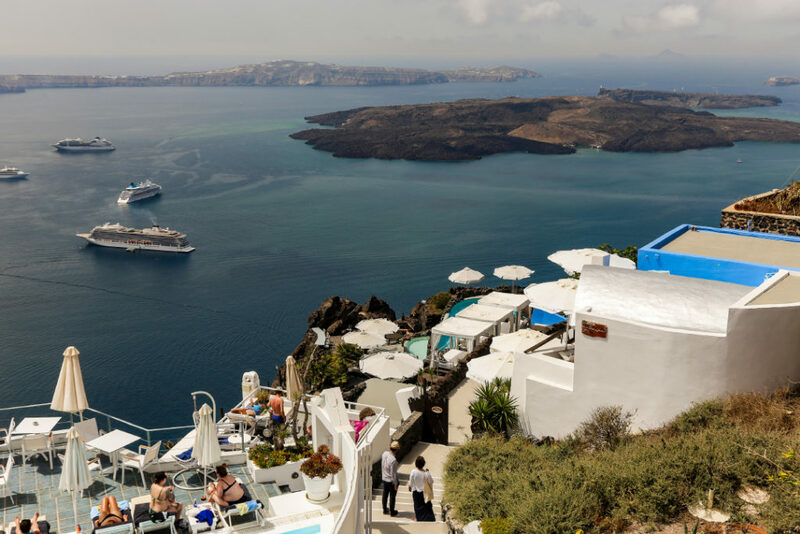 Their schedule allows passengers time to linger for sunset dining atop Santorini’s cliffs or indulge in the famous nightlife on Mykonos without worrying about missing the boat.) All cruise-ships provide island tours and excursions to archaeological ruins, beaches or shopping venues. Mykonos may be the glitziest of the Greek isles; it is often compared to Spain’s Ibiza for its vibrant nightlife. The busy shoreline is lined with cobbled alleys, white stucco restaurants and numerous tourist shops. To reach rocky Delos, take the half-hour ferryboat ride from Mykonos. You’ll get the bonus of photographing the iconic Mykonos windmills in the distance. Delos is one of Greece’s most important archeological sites, famous as the mythical birthplace of twins Apollo and Artemis, and a place of pilgrimage. Today, the island lies in intriguing ruins and its history humbles the many tourists who walk among the ancient relics and the Sacred Way. The most compelling feature remains the Terrace of Lions. Built in the seventh century BC, the lions honored the gods and acted as a symbol of wealth. The modern Delos Archeological Museum houses an excellent collection of pottery, mosaics, statues and the original, but wind-eroded lions that once stood in the Terrace of Lions. Replicas of the beloved marble lions replaced the originals in 1991. Delos is a haunting, desolate place, and well worth a visit. Milos is the kind of spot that excites a traveler: few crowds, mysterious landscape, incredible beaches, and site of the discovery of the famous statue named Venus de Milos. Sarakiniko Beach, one of the world’s most-incredible beaches, was created by a lava flow. Centuries of Mother Nature’s powerful winds eroded the coastline forming mysterious and marvelous shapes. It’s a lunar-like white/beige landscape, like something from a Dr. Seuss book. The ecru colored mounds (not black lava) look like sand but hold firm, not squishy. The swimming water is as clear as any liquid you’d drink. Milos feels magical with colorful little Greek villages, ancient catacombs and panoramic vistas. For the moment, Milos remains a hidden gem. Most cruise ships do not stop there, but the captivating isle is bound to become more popular. Everyone’s seen classic images of Santorini: clustered, whitewashed, terraced houses clinging to high crimson cliffs – highlighted by marine blue church domes. Spectacular sunsets, black sand beaches, and legends of the lost continent of Atlantis add dramatic color and mystery to an already full palate. The volcanic island’s wow factor just has to be seen and experienced in person. The first glimpse will dwarf you. Santorini’s almost vertical cliff and its high, overhanging terraces look precarious. From the hilltop summit, even massive cruise ships look like toy boats in the harbor. Passengers disembark from tender boats at the main harbor, then choose the gondola, a donkey ride or a long hike some 885 feet up the zigzag path. The tourist-centric village of Fira nests at the top of the gondola run dangling like a fish on a hook. An earthquake devastated Fira in 1956, but the persistent inhabitants rebuilt. Narrow alleyways and tight staircases squeeze between terraces of white stucco cave houses, small hotels, bars and restaurants. Visitors may push on even higher as the swoon-inducing views expand. The upper elevations dramatically showcase how today’s alluring vista resulted from a violent volcanic eruption around 1450 B.C. The large harbor underscores the vast amount of land sunken into the sea by the tumultuous event. Photos don’t give justice to this panoramic swoosh. Pass your time taking photos, shopping and dining or consider sailing, snorkeling, swimming and hiking adventures. The lava-strewn trails amid steaming volcanic vents and sulfur smells attract hikers to nearby Nea Kameni. History buffs love Akrotiri, the archeological site unearthed in 1967. Sunset cliffside dining ranks as a nightly Santorini ritual – a memory made even lovelier by the sounds of live, traditional Greek music floating in the air. Without question, Santorini is one of the most romantic spots in the world. The Greek island of Crete had one of the earliest civilizations – dating back to the Bronze Age. The Minoans employed skilled workers who built complex architectural marvels and created intricate artistic works. The Palace of Knossos, near Heraklion, provides the best look at Minoan society. The first palace, built around 1900 B.C., contained over 1,000 rooms, an elaborate drainage system, flushing toilets and paved roads. An earthquake destroyed it some 200 years later. Soon afterward, the immense structure was rebuilt, but fire later claimed it, too. The ruins were lost to the ages until excavations began in 1878. Between 1900 and 1929, Sir Arthur Evans led the controversial rebuilding of some palace sections. I appreciated the opportunity to see that work, and understand how the site may have looked in its glory. Guides recall the legend of King Minos, who ruled the palace, and the famed Minotaur he kept in the Labyrinth. Highlights include the royal apartments and copies of the unearthed frescoes, and the throne room featuring the original throne. Stop at the Archeological Museum of Heraklion housing most of the palace’s priceless artifacts. See the fragments of the original Knossos frescoes that provided scholars insights into the lost civilization. If you follow the PBS series the Durrell’s in Corfu, you will delight in this island stop in the Ionian Sea. Here you can tour the palatial estate and retreat of Empress Sisi, wife of Emperor Franz Joseph, the 19th century monarch of the Austrian-Hungarian empire in Europe. Cruising the Greek isles provides an authentic taste of Greek culture, history and, of course, Greek cuisine. Always fresh and flavorful, Greek fare is another reason to visit. Specialties like stuffed grape leaves, tzatziki, spanakopita, Greek salads and a fabulous variety of olives spice up the menu. Fresh grilled fish and seafood are staples accompanied by Greek wine, especially the white Assyrtiko, and the traditional ouzo, licorice flavored liqueur. Most cruises start and stop in Piraeus, the port nearest the capital city of Athens. Fly into Athens a day or two early to see the priceless antiquities in the Acropolis, Acropolis Museum and National Archeological Museum.